Your saddle is one of the most important pieces of equipment you will buy as a horse enthusiast. 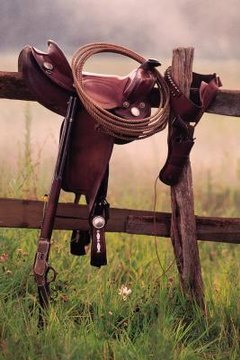 Western saddles cost anywhere from a couple hundred dollars to several thousand dollars, depending on quality. High quality, well-made saddles will last for decades as long as they are cared for properly. Most saddles spend a couple of hours a day on the back of a horse and 20-plus hours a day in storage. Storing your saddle improperly can lead to moldy, dried or cracked leather as well as rips, tears and damage to the internal structure of the saddle. It's best to keep your saddle in a climate controlled tack room where temperatures will not be extremely hot or extremely cold. Saddles do best when stored in a cool, dry room. If you do not have a climate controlled area available, keep your saddle stored indoors in a secure, weather-proof location with a saddle cover over it. Keep your saddle on a saddle rack when it is not on your horse's back. Do not stack multiple saddles on a saddle rack that is only intended for a single saddle. Do not lay the saddle on the ground on its side, stand it on its fork (the area were the horn is located), or dangle the saddle by the horn. Improper storage can damage the tree of the saddle over time, shortening the usable life of your saddle. Your western saddle needs to be cleaned regularly to stay in good condition. Dirt and dust should be brushed off the saddle after every ride using a dry washcloth or a stiff bristled grooming brush. Once a week, completely clean your saddle using saddle soap and then oil it with a leather conditioner. Regular cleaning and oiling will keep your saddle's leather in the best condition possible. Remember that it is normal for a saddle to darken over time, due to use and cleaning. Even the best cared for pieces of tack require periodic maintenance and repairs throughout the years. Loose stitching should be fixed by a saddle repair professional, as should any tears or rips in the leather. When the fleece on the underside of the saddle wears flat or begins to rub off, have a professional replace it. If any screws, conchos or buckles appear to be working themselves loose or fall out, they will need to be professionally replaced to keep your saddle safely functional. When it comes to western saddles, you get what you pay for. Good quality saddles are constructed with high quality leather and will withstand decades of use. On the other hand, a poor quality saddle is not going to hold up long-term, regardless of how well you try to care for it. Saddles that are made from low quality materials will not hold up to the rigors created by regular riding and cleaning. Research prospective saddles before you buy and make sure you are buying a saddle that will hold up long term.